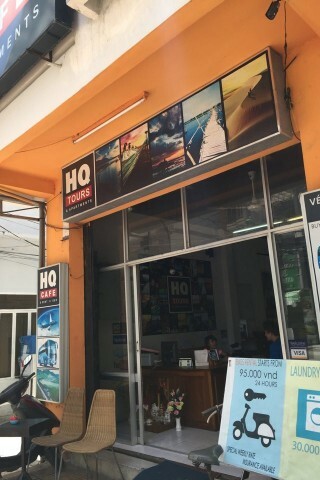 In many ways HQ Hotel (also known as HQ Apartments and Cafe) is your typical budget hostel but backpackers will appreciate the larger than average bunks and the eight-bed dorm room, which has a huge common space and a surprising feature: a flatscreen TV and sofa. This could be both a positive or a negative – let’s hope some knob doesn’t decide to watch MTV Vietnam at four in the morning. The shared ensuite bathroom could be slightly cleaner and everything, including the private rooms, is a tad rundown. Flashpackers would probably prefer Tabalo Hostel which is only a buck more. The hostel motto is “in strangers – out friends” and this is really why you would want to stay here. The place has the same social vibe and cheerful, helpful staff as True Friends Inn, which is just a block south on Nguyen Thien Thuat Street. They also have all the usual services like laundry, WiFi, tour, bike and transport booking, and a simple breakfast included. Like all joints in the tourist centre, the beach is a short walk away.